Where did July go? It’s been more than half a month since I last posted! It’s more a case of where I’ve been, I guess … In Queensland, the beautiful North East Australian state just a helicopter skip from the Great Barrier Reef. The scenery is to die for. 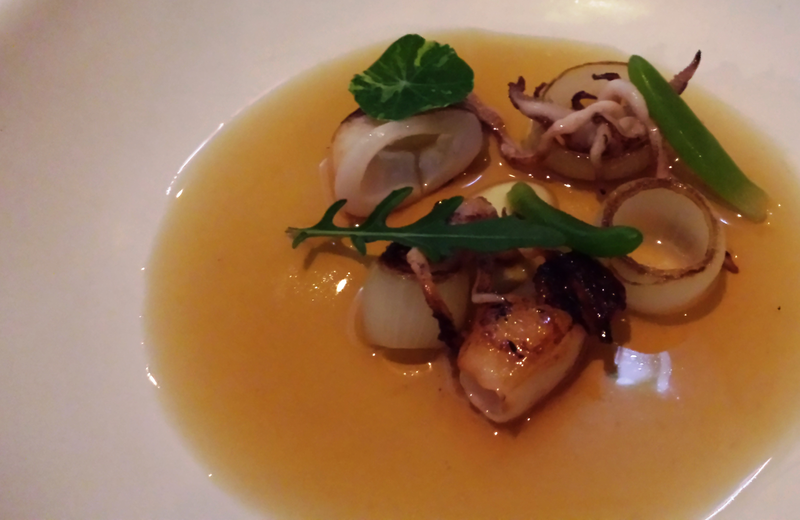 Glutton that I am though, this first post about Queensland will be about food. (1) Native fruit infusion – Nice and cold, but not outstanding. In fact, it tasted more like kiddies’ fruit punch than anything else. (2) Sweet corn soup and corn-cream popcorn – It didn’t look great but man! The soup embodied the essence of buttery charcoal grilled corn while the popcorn was a lovely morsel was crunchy on the outside and all soft creamy corn inside. 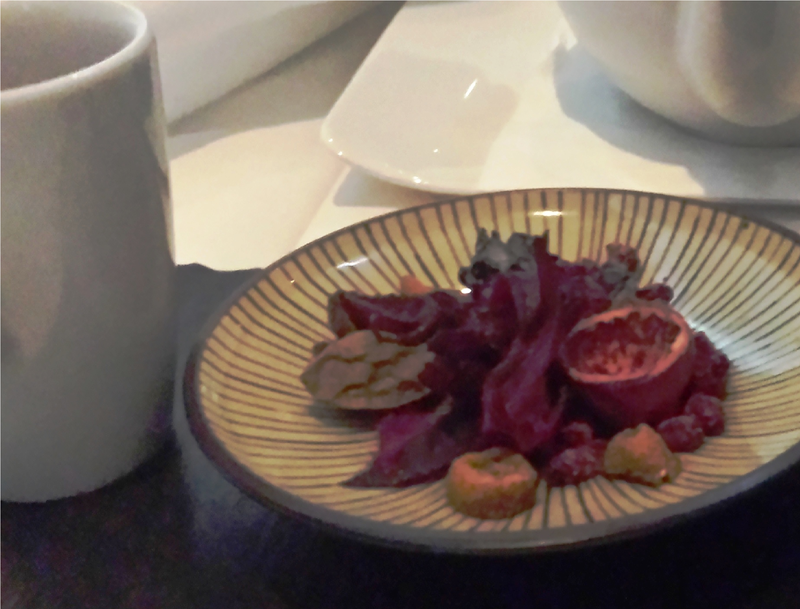 (3) Duck consommé and deep-fried duck’s tongues – I don’t normally eat duck’s tongues. These were small and crispy with a nice 5-spice powder taste that contrasted well with the consommé, which had a rich deep ducky flavour permeated with star-aniseed. 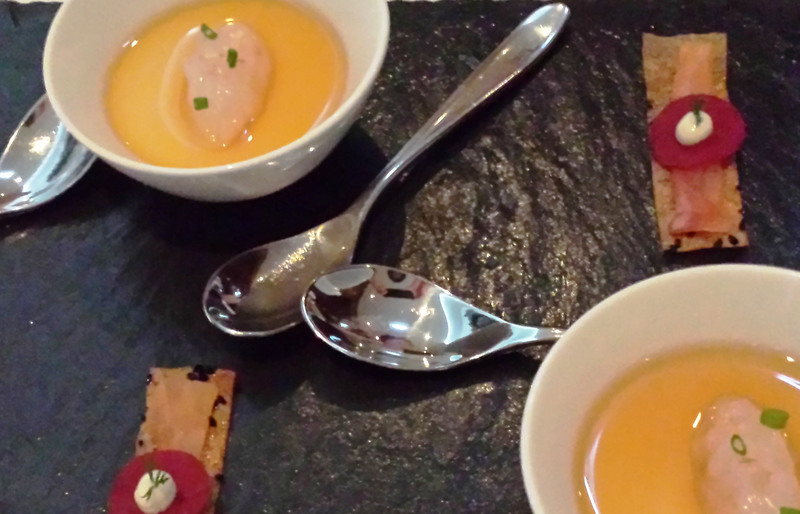 This combination provided a nice transition to the last amuse bouche. The salmon was smoky and rich, but less so than the duck. The juniper cream was a slightly fresher riff on the star-anise tastes of the previous course. The chia-seed crackers reminded of the crispy duck tongues but were crunchier and nuttier. Actually, the crackers were sooooo good, I could have eaten them alone. All of them! The custard was well rendered, silky smooth and subtly flavoured. Youngest Son loved the carid prawns, but I just don’t have a taste for half-cooked chopped up seafood. We agreed to disagree. 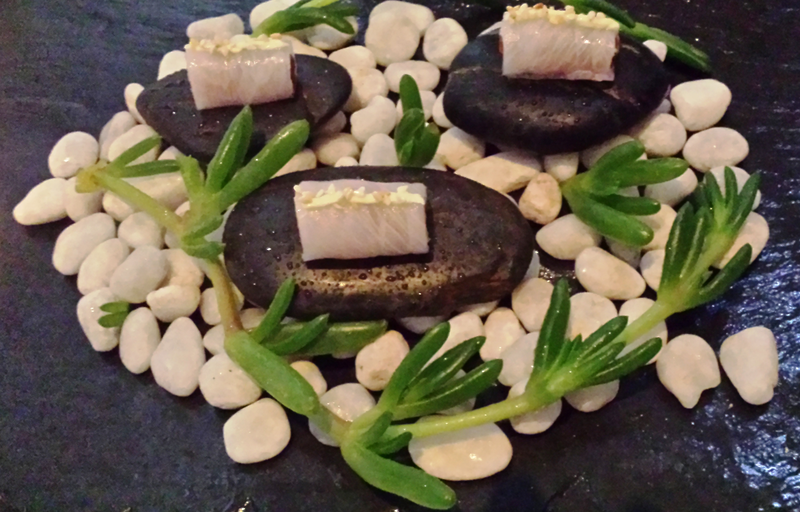 (6) Cobia sashimi – This was the highlight of the amuse-bouche for me. The thinly sliced cobia was super fresh and came out wonderfully chilled and wrapped around little slivers of vinegary cucumber which crunched just right. Chef Alejandro Cancino surely has a deft hand with appetizers. There’s only the degustation menu at Urbane, but if they were just to start a “tapas” service with the amuse-bouche offerings, I’m sure it would be a success. (7) Oyster – A semi-cooked oyster I didn’t quite like, but absolutely delectable pearl-sized morsels of grilled cauliflower and halves of brussel sprouts accompanied by rich little nuggets of pan-fried sweetbreads that were crispy on the outside and butter soft inside. (8) Octopus with Green apple, avocado and rye – Beautiful tender octopus charred just right, little chunks of soft avocado and the crunch of roasted rye. What was not to like? 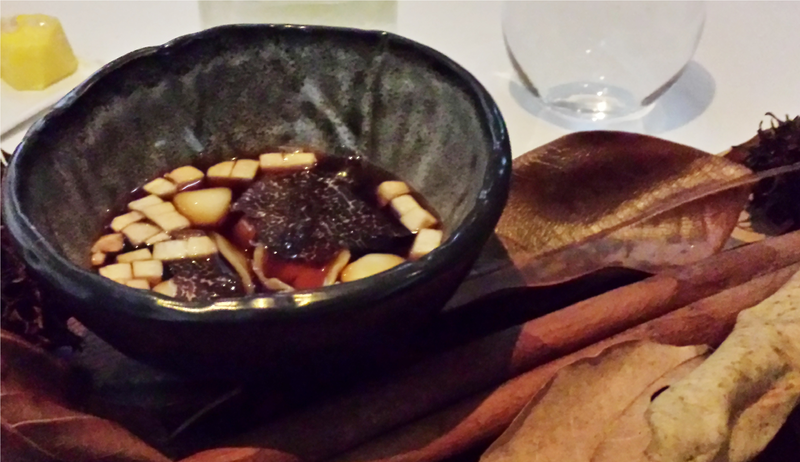 (10) Winter – This was a beautiful Portobello mushroom, barley, turnip and taro root soup garnished with Australian black truffle shavings. The combination of soft barley, slightly crunchy turnips and chewy taro with the earthy mushrooms and truffles was spot on. What a warming concoction for a winter’s night. (11) Hapuku, chicken liver, Portobello and yeast cream – The ingredients were wonderful. But, fresh fish does not go with a rich yeast cream, a delectable chicken liver and a flavourful mushroom redolent of Australia’s deep red mineral earth. We might have done better with chicken or quail. This was the only dish that we all thought was a failure. 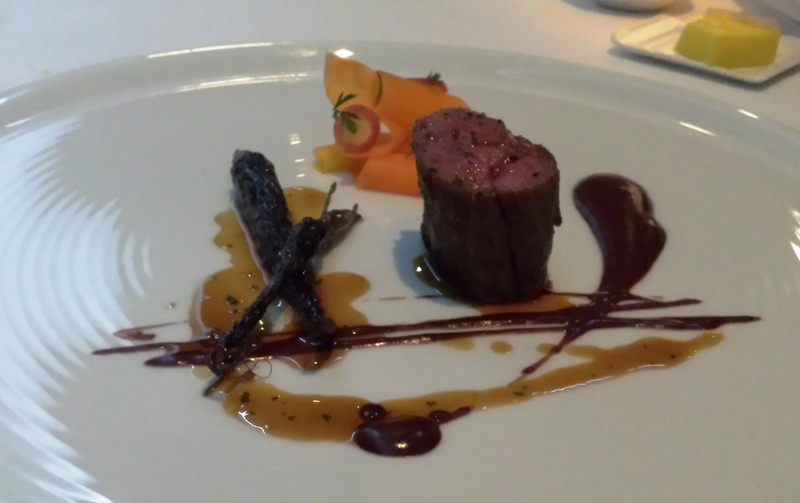 (12) Wagyu, black pudding and carrot – The most difficult thing is getting the simple things right, like a piece of grilled tenderloin. At Urbane, our tenderloins were just so! As was the little slice of saute’d black pudding. The simply pickled carrots garnished with a single slice of red-rimmed radish was just the finishing touch – tart, cleansing, beautiful. (13) Local pink lady apple, lemongrass and ginger – So much went into the melange, I can’t remember anything about it except that it was complex and multi-flavoured. I do remember I enjoyed it. But, maybe less is more? (14) Coconut, blueberries and basil – The combination of rich tropical coconut ice-cream with a slightly sweet, slightly salty basil sauce was orgasmic. Hints of laksa or green curry, but for dessert! The blueberries didn’t quite work. Perhaps a caramelized grilled pineapple ring instead? But yes, the coconut basic works! (15) Eucalyptus pain perdu – There are no pictures of this because we thought it would be boring. It turned out to be sublime! ‘It’ being slices of brioche soaked in egg and eucalyptus honey, fried, then dusted with castor sugar. In short, French toast. We would have had more, if we had room. It was definitely the highlight of the evening. Yes, I know gluttony’s a sin. We ate far more than we needed. The money might have been better spent on poor kids and sick people. But, sometimes, it’s right to let loose and savour the wonders of the world. ← Caught in the rain! Wow sounded very decadent I hope your holiday was a good one and not too much rain? My sister lives up that way and was complaining that she had to wear a jacket in winter. Cant wait to hear more about your Aussie trip Audrey, thank you for sharing your evening of gluttony with us and welcome back I missed you. It was lovely in Brisbane but not so good in Cairns. Friday 12th was fine though and we managed to get out to the reef. I’ll be doing a 3 city in the week of October 20th – Melbourne, Brisbane and Sydney. There’s some business to do and if we can get the appointments, we’ll be doing book readings in Melbourne and Sydney. You deserve it, I hope you had a wonderful night. Sometimes you just have to “let loose and savour the wonders of the world,” yes indeed. Ducks’ tongues — Doesn’t that just bring up images of utter decadence and the decline and fall of the Roman empire. I do believe I first read about them in one of those Steven Saylor Roman Empire ‘whodunits’. But apparently Chinese emperors at them too. Thanks for your kind words but I still feel vaguely guilty.